You are at:Home»Cruise Tips»Isn’t Cruising for Older People? This is a question we still encounter from time to time – a slightly archaic perception that cruise holidays are dedicated to shuffleboard and early nights. Despite revolutionary new features aboard ships appealing to the whole family, and even an episode of The Simpsons dedicated to Bart’s love of cruise holidays, some people still believe cruise holidays are just for the newly wed or nearly dead. Here we dispel the myth with perfect cruises for every age range. Cruise ships have adopted a flexible approach to keeping kids entertained and happy whilst on board. 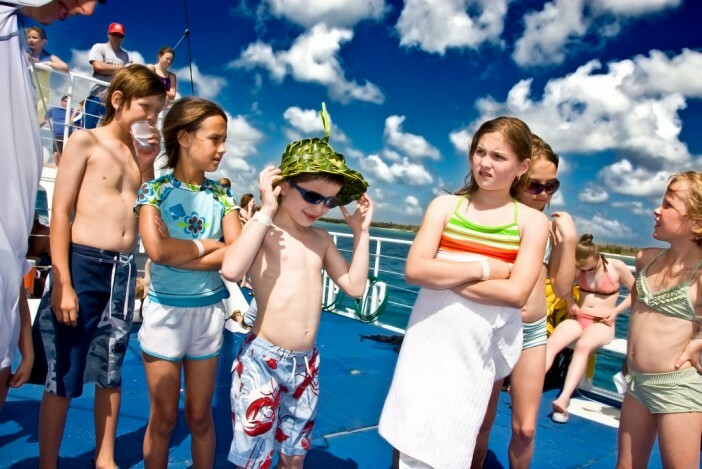 Understanding kids have a wide range of different interests, large liners have a huge selection of kids’ activities, facilities and amenities. From kids clubs for the youngest charges with activities such as treasure hunts and face painting to huge water slides and kids-only swimming pools. The Grand Class of cruise ships from Princess Cruises each have a 10,000 square feet Fun Zone, dedicated to sports tournaments and games. Often the most difficult of all the age groups to satisfy – moody teens shuffling despondently with their headphones in and their eyes fixed on the screen of their phones. Cruise companies have made a concerted effort to improve their appeal to the teenage market by granting them freedom and the ability to make their own decisions on board. Understanding teens’ love of staying in contact with their friends and checking the net; Royal Caribbean are dedicating efforts to bringing the fastest internet speeds on the sea to their ships – available for use in internet cafes and on mobile devices. Cruise holidays are fantastically well-suited to young couples looking for romantic breaks to beautiful destinations in luxurious surroundings. Cruise itineraries are constantly evolving to incorporate more and more remote and romantic locations such as the beautiful islands of the South Pacific. With couple’s spa packages, incredible dining options and intimate balconies with sea views – cruises are the romantic way to travel from one beautiful destination to another. Whilst cruise holidays can be a relaxing way to recharge your batteries, they can also provide a platform for adventure and excitement. With an added impetus on exciting on-board sports including Royal Caribbean’s new surf and skydiving simulators; cruise holidays can deliver a non-stop, all-action adventure. Cruise holidays are ideal for snorkelers and scuba divers wanting to explore the beauty of the Coral Reef. Taking passengers to a number of great locations and entry points, cruises are the perfect way to explore the beautiful depths of the sea. Despite the effort to attract a new audience and new generations, cruise ships have remained loyal to their long-standing customers by retaining the features and traditions they love the most. From formal nights to the traditional lobster dinners, the cruise holiday classics are going nowhere. Cunard’s fleet in particular are dedicated to retaining the stylish luxury of cruising the seas with their famous White Star Service. For a full selection of cruises, visit the Cruise1st website or call our dedicated team on 1300 857 345.